New Closet Accessories for 2017! OUR NEW CLOSET ACCESSORIES ARE HERE! We are excited to introduce our new lines of closet accessories. These accessories will appeal to any style and taste. With multiple fabric color and finish options now available, we are primed and ready to make THE perfect closet for you this year! You can check out our full line of closet accessorieshere but we may as well give you a quick overview of a few of our new favourites! Our new laundry hampers are easy to remove and carry to the laundry room with one hand. These bags are beautiful, deep, removable and available in 2 different widths. A laundry hamper is a great accessory to add to your master bedroom closet or your laundry room. Great for kids rooms to keep all their dirty clothes in one place! These pull out shoe organizers are the perfect solution for shoes to utilize the closet depth and allow easy access. There are two widths available - an 18" holds up to 6 pairs of shoes while a 24" holds up to 9 pairs. Specially designed sandal clips convert the front row into sandal or flip flop storage. This jewelry storage solution tucks under a fixed shelf, using minimal space. The completely customizable grid is specifically sized for jewelry, ties, glasses and more. Any combination of the grid dividers can be removed, changing the spacing so that it is perfectly sized for sunglasses, belts, larger jewelry, mobile phones, etc. These storage boxes are available in the same slate and beach fabrics to match our entire new collection. 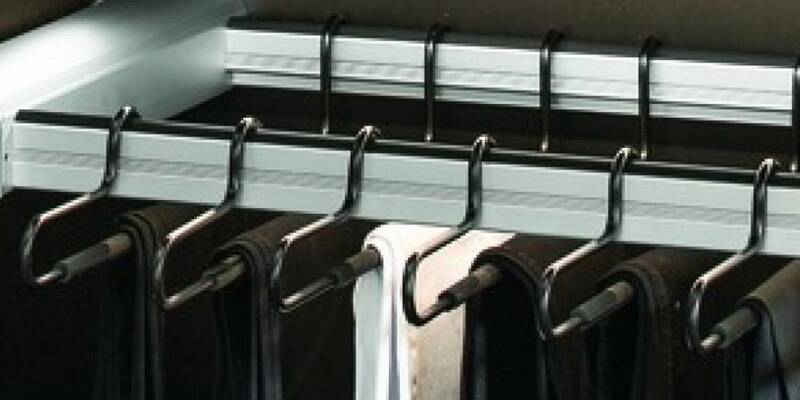 They are perfectly sized to fit either 18" or 24" sections and the 7 3/8" height fits perfectly on the top shelf of your closet - maximizing the space and allowing for the perfect final touches on your custom closet! For more information on our new custom closet accessories come visit our showroom. These accessories will be on display soon!